Editor’s Note: Due to the sheer size of Elder Scrolls Online, we’re publishing our hands-on impressions in three chunks. Part one is here. What follows is part two. Queen Ayrenn is a modern monarch. She’s definitely trying to do the right thing, but I can hear the weariness in her tone when she tells me about the endless rituals she must complete in order to be accepted by her subjects. I’m not sure what happened to her during her 17 year absence, nor why she returned to the kingdom at age 28 to inherit the throne of Alinor. Honestly, I don’t much care. What I do care is that she is tired. She knows these rituals and adventures are necessary, but she finds them tedious, if dangerous. She’s always glad to see me. I always want to help her. 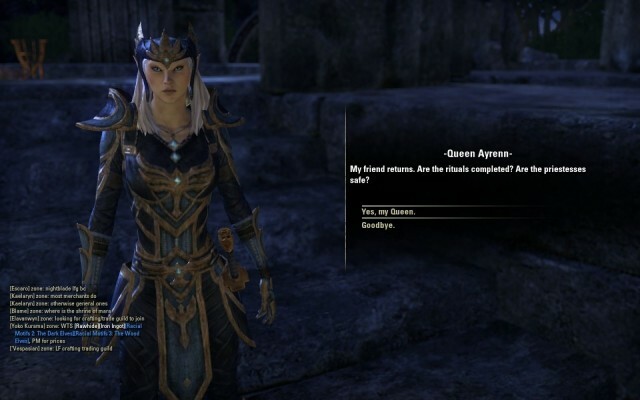 I’ve bonded with Queen Ayrenn, and she’s not even real. When I travel to a new place in the real world, one of the pure joys of the experience has always been the people I meet there. That’s probably why I like MMOs so much — they’re full of people. There are non-player characters, or NPCs, who tend to fall into one of two categories: the folks who wander around the world to keep it from looking deserted, and the folks you talk to to get your next story quest. There are over 10,000 of these digital folks running around the game. There are player characters, like you, who generally dash about doing what they need to be doing — finding quest items, fighting zombies, ghosts, or enemy soldiers, or hanging around the cooking fire, making food that will raise their stats for a certain amount of time. Both groups of people are pretty fascinating in Elder Scrolls Online.